If you are looking for a quality, dependable water softener that is going to last you years, then you should look no further then Fleck’s line of water softeners. The company has been around for decades, and with a 5 year warranty on their valves and a 10 year warranty on the tanks, you can be confident that your brand new water softener will continue to provide fresh water for years to come. Like most water softener manufactures, they have several different types as well as sizes depending on the water quality in your home and your usage. All of the units we are going to cover come with the latest in high technology and dependable lcd displays, which make operation of the units effortless, in addition to making them more energy efficient, since they only regenerate when needed. Easy Installation – All of the fleck water softeners come fully assembled, they even provide you with a funnel in the event that you have to put the medium in the tanks. Environmentally Friendly – All of the materials in the units are environmentally friendly and since the units themselves use a smart controller, you will actually use less electricity, salt and water while the units are in operation. Part Availability – Let’s face it no one likes to have to fix or replace any home appliance, it’s even worse when you find out that you can’t get replacement parts or it’s a chore just to find them. You simply won’t have that problem with Fleck water softeners, since they are so popular and widely available, you can get replacement parts from your local water softener supplier or the manufacture directly. WQA Approved – Fleck water softeners have the Water Quality Association seal of approval, meaning they are proven reliable and meet the associations quality standards. When choosing the proper water softener for your home or business, you want to make sure you test the quality of your water. Below you will find several of the best fleck water softeners, as well as a comprehensive review on the different models, grain capacity and overall dimensions to help you pick the proper unit. The Fleck 5600SXT is the most popular model of all of the Fleck water softeners on the market. It comes with an impressive 5 year valve warranty and 10 year tank warranty, meaning that it is going to be filtering your water for a long time to come. With a generous 48,000 grain capacity, it is perfect for most average homes in the United states. Unlike some water softeners which still rely on mechanical meters to check on the operation of the unit, the Fleck 5600 has the latest in digital electronic metering. Making it a breeze to program as well as check on the overall operation of your unit. Compared to saltless water softeners, this unit can purify more water and will be more efficient. Customers that have tried saltless water softeners and that were not happy with the experience were quite pleased with the fleck 5600sxt. If you have issues with salt, you can use conventional potassium chloride pellets instead, with the generous 250 gallon tank, you can fill it up and not have to worry about it for awhile. The Fleck 7000sxt is perfect for large homes or light commercial use. The system has a 80,000 gallon grain capacity and is a convenient two tank system. In addition to softening your water, it is also an iron water filter, making it a convenient solution to tackle two problems at once. Like the fleck 5600, it also comes with a 5 year warranty on the valve and 10 year tank warranty. And since it uses a metered electronic controller, it is more efficient and will save you money in the long run. Installation of the fleck unit is straight forward, and can be completed by most homeowners in a couple of hours. If you need help or get lost along the way, the manufacture can provide resources and more information to you over the phone. The system is recommended for 4 bathrooms or large homes, that need a quality dependable water softener to get the job done. While it can be used for light commercial use, it is not recommended and you should really go with a commercial water softener, to preserve your warranty as well as keep up with the water demand. 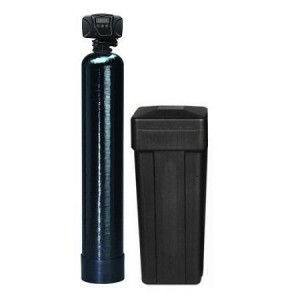 The Fleck 9100sxt is a high performance water softener unit, that uses twin alternating tanks to insure that you will never run out of water. With a 48,000 grain capacity, it’s perfect for average sized homes with poor or extremely hard water problems. The unit has a maximum flow rate of 12 gallons per minute. Since, the system used a smart digital controller, it’s more efficient and can actually save you money in the long run, since it regenerates based on your water usage and quality, not simply based on time. Fleck water softeners and water filters have been around for decades, known for their reliability and performance. While it is recommended that Fleck water softeners be installed by a professional plumber, they can be installed by homeowners with some plumbing experience in about two hours. Besides Fleck water softeners, we also recommend Waterboss water softeners as well as Northstar water softeners for most single family homeowners who are looking for a conventional water softener.